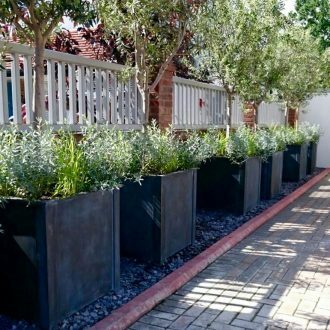 To create a mature green screen why not plant a series of our large Square Planters with Olive trees and silvery grey under-planting? We’re delighted to see Alex Forster using our new planters as the perfect solution for his client’s garden in Surrey. Thank you @GardenRequisite for the amazing planters. The friendliest, most efficient and organised company ever! Excellent graftmanship.